Located in the Top End and hoping to strike it rich on the lottery? Here you can discover all the different lotto prize draws available in the Northern Territory, including Oz Lotto, Powerball and the Monday and Wednesday night lotteries. We also explain where you can buy NT lotto tickets online so you can be in the running for a multi-million dollar prize without even having to leave the house. All lottery services in the Northern Territory are operated by the Tatts Group, the largest lotto provider in Australia. Tatts operates lotto games in the Northern Territory, Victoria and Tasmania, with multiple draws happening every week constantly producing life changing wins. All other smaller scale NT lotteries including business lotteries and community gaming activities are licensed and regulated by the Northern Territory Government. We’ve detailed below a list of all the major Tatts lotteries available to players in the NT. Oz Lotto is the big mama of them all, running nationwide to result in huge jackpots, including a minimum Division One prize pool of a whopping $2 million. Given its popularity nationwide, jackpots in Oz Lotto have been known to soar to as high as $50 million and beyond. 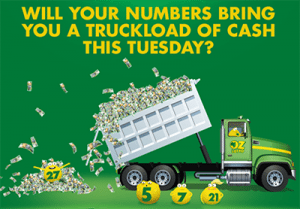 The Oz Lotto takes place every Tuesday night, with seven prize divisions up for grabs. The game consists of 45 numbered balls from which seven winning numbers are drawn at random. To win the division one prize, you’ll need to match all seven numbers. Games start from as little as $1.20 for one standard game, and you can choose your own numbers, buy QuickPick tickets or play Favourites if you have a registered Tatts Lotto card. Oz Powerball is another nationwide lottery draw with the potential to change lives. Division One prize pools start at a minimum of $3 million, with jackpots growing to over $50 million. Powerball runs every Thursday and is easy to play, requiring you to pick six numbers from one to 40 for one section, and one number from one to 20 from a second section (this is the Powerball number). Six winning numbers are then drawn from one barrel, and the lucky Powerball drawn from another barrel. To win the Division One prize, you’ll need to match all six numbers plus the Powerball. The minimum you’ll need to win some dough is two winning numbers plus the Powerball, which will earn you the division eight prize. Oz Powerball tickets start from a minimum of $3.70 for four standard games. TattsLotto is the Saturday night lotto which is shared by NT, VIC and TAS residents. Players have the chance to win from a Division One prize pool of $4 million, while TattsLotto also runs special draws throughout the year like the $20 million Superdraw and the Christmas $30 million Megadraw. It basically works in the same fashion as the Oz Lotto, where players are required to select six lucky numbers from one to 45. There are six winning divisions, with a Division Six prize available by picking one or two winning numbers and two supplementary numbers. TattsLotto tickets can be bought for a minimum of $2.85 for a minimum of four games. Every Monday and Wednesday night, players in the Northern Territory have the chance to win a $1 million Division One prize pool which is guaranteed for up to four winners. Throughout the year this lotto draw also holds special events like the chance to double the prize money. Just like the lotteries mentioned above, players are required to select eight numbers from one to 45. Six winning numbers are drawn, including two supplementary numbers and you’ll have to match all eight to walk away with the Division One prize pool. Monday and Wednesday Lotto games can be played from $2.40 for a minimum of four standard games. If you’re a soccer fan, The Pools is the lotto game for you. Although this unique lotto game is ultimately based on luck and all players can play regardless of soccer skills, some knowledge of soccer may come in handy. The Pools lotto is based on the outcome of six soccer games played throughout Europe and Australia. To play, pick six numbers from one to 38, based on the soccer matches you believe will have the highest scores at the end of the lotto period. Tickets for The Pools start from just $2.20 for a four game minimum. If you don’t know much about soccer, you can simply buy a QuickPick ticket. Set for Life provides the chance for NT residents to win $20,000 every month for 20 years. Every Set for Life ticket gives you entry into seven draws over seven days, with multiple chances to win each day. To play, select eight numbers from one to 37. To win the major prize, you’ll need to match all eight of those numbers with the winning numbers drawn, although smaller prizes can be won from selecting just five winning numbers. Set for Life tickets start at $8.40 for two standard sets of seven days of play. Lucky Lotteries is a fun, easy lotto game running nationwide and guarantees more than 10,000 winners in every draw due to the limited number of tickets available for each draw. The winning numbers are drawn at random once all Lucky Lotteries tickets have been sold. The game comes with two jackpots – the Super Jackpot and the Mega Jackpot – with each game having 10 cash prize levels, 10 consolation prizes and one jackpot prize. The Super Jackpot comes with a one in 24 chance of winning, while the Mega Jackpot comes with a one in 17 chance. Super 66 is an additional game which can be added on to any NT lotto ticket. It’s played in all states throughout Australia excluding NSW. To play, all you need to do is mark the ‘Super 66’ box when purchasing any other lotto ticket, for which you’ll receive a six digit number at an additional cost of $1.10 per game. If your six digit number matches the six winning lotto numbers drawn, you’ll walk away with a Division One prize of $16,666 or more.